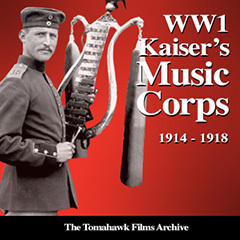 In an incredible example of archival sound restoration, Tomahawk Film Music is proud to announce possibly the rarest military-music CD you will ever own and certainly our most expensive audio-production to date! Discovered in 1997 in the attic of a house in the medieval Eastern German town of Quedlinburg by music-enthusiast Tony Dean, this unique collection of the earliest-known German military 78rpm-shellacks survived the upheaval of the First World War, the Allied saturation bombing of World War II and the post-war Russian Occupation and now, almost 100 years on, have been painstakingly restored by one of the UK’s most experienced studio engineers, Simon Wood, using the latest versions of Cedar Noise Reduction and the updated Sadie-DEW audio-editing systems! Offering the rarest insight into German Instrumental and Bandstand Music of the Great War, these incredible old shellacks were originally recorded before Spring 1916 and are representative of the 78rpm records German officers played on their wind-up gramophones in the trenches, so reminding them of the ‘golden years of peace’ before August 1914! Working with antique recordings of bands playing 'live' into a large horn onto wax cylinders, some very old faults cannot be remedied without physically altering the integrity of those records, so in places the odd, click, hiss or tiny section of distortion will still be apparent, but remembering their true age and rarity, one must marvel at the stunning job that ‘Woody’ has done to bring these recordings back to life!